Tens of thousands of Israelis, including lawmakers and public figures, will throng Hevron this weekend as part of the traditional "Shabbat Chayei Sarah". The event occurs annually on the week in which the Torah portion of 'Chayei Sarah' is read, in which the Biblical patriarch Abraham buys the Cave of the Patriarchs in Hevron. Revelers will be hosted in local educational institutions and in the homes of residents. The event features dancing, a mass communal meal, and speeches highlighting the city of Hevron's importance in Jewish history. 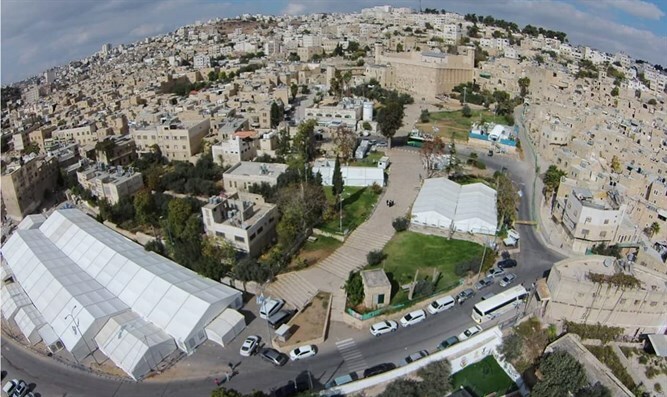 This year, a huge and lavish tent will also be set up by Hevron's Chabad movement, where thousands of guests will eat the three Shabbat meals. This year's event will commemorate two recent developments: The official opening of the archeological site at Tel Heron as an official site of Nature and Parks Authority and the government's recent decision to approve a new apartment building to be built in Hebron. Uri Karzen, the director general of the Jewish settlement in Hebron, said that "I am excited about Shabbat. It is a special holiday for Hebron and the people of Israel all over the world. In the not-too-distant future, with God's help, we will host guests in the new buildings that are expected to be built in the Hezekiah quarter." "We wish thousands of guests and residents a Shabbat of peace and joy "
"The Chabad movement has always considered it very important to stand on the right of the Jewish community in Hebron," added Hevron's Chabad emissary Rabbi Danny Cohen. "It was very exciting to lead the largest Shabbat meal in the world, right here at the foot of the Cave of the Patriarchs, together with thousands of Jews who will arrive in Hebron."